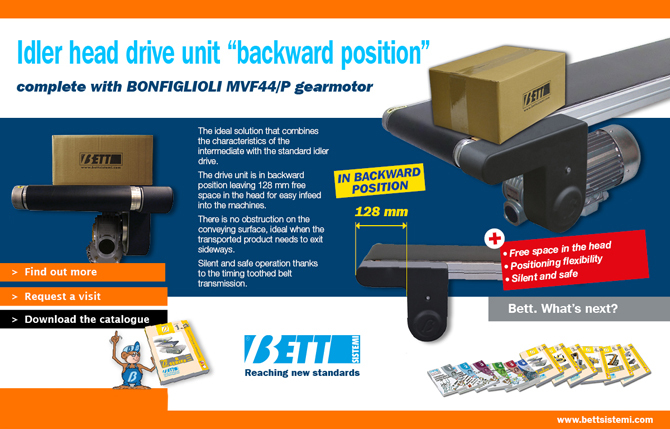 The idler head drive unit (backward position), complete with BONFIGLIOLI MVF44/P gearmotor, is the ideal solution that combines the characteristics of the intermediate with the standard idler drive. 128 mm free space in the head for easy infeed into the machines. There is no obstruction on the conveying surface, ideal when the transported product needs to exit sideways. Silent and safe operation thanks to the timing toothed belt transmission.